Competencies and skills of the doctorate holders are frequently perceived a guarantee for professional careers in many occupations and a solid contribution to scientific excellence, country innovation capability, and economic and societal development. The assumption that doctorate holders are easily integrated in economic endeavors proves wrong which calls for a revision of the widespread thinking about this extremely specialized and trained people. Ongoing debates neglect the fact that doctoral degrees are academic degrees which testify degree holder’s competence in research which is to be viewed a profession with specific skills. Innovation per se is hardly included in this profession. Also, PhDs are expected to engage in teaching but against their teaching duties they are not obliged to receive education or training of teaching skills. This is even more remarkable since teachers at primary and secondary level are always educated in teaching methods but tertiary level teachers are not. The essay argues that PhDs should be viewed as research professionals and research as a profession. This requires a change in the perception of both by policy makers but does not say that there is an urgent need for policy intervention in regulating the competencies and skills which are included in the respective professional standards. Leonid Gokhberg, Dirk Meissner and Natalia Shmatko contributed equally to this work. The article/book/book chapter was prepared within the framework of the Basic Research Program at the National Research University Higher School of Economics (HSE) and supported within the framework of the subsidy granted to the HSE by the Government of the Russian Federation for the implementation of the Global Competitiveness Program. The essay builds on Gokhberg and Shmatko’s book Gokhberg, Leonid, Shmatko, Natalia, Auriol, Laudeline (Eds.) ‘The Science and Technology Labor Force-The Value of Doctorate Holders and Development of Professional Careers’, Springer International Publishing, ISBN 978-3-319-27208-5. Goossens M. (2012). What career in industry for engineers with a PhD? CLAIU-EU Conference. The Engineering Doctorate, Madrid, 9-10 February 2012, http://claiu.fabi.be/home/wp-content/uploads/2011/12/SEII-CLAIU-2012-Paper-Marc-Goosens1.pdf. Accessed 25.Jun.2015. Meissner D., Shmatko N. A. (2016). 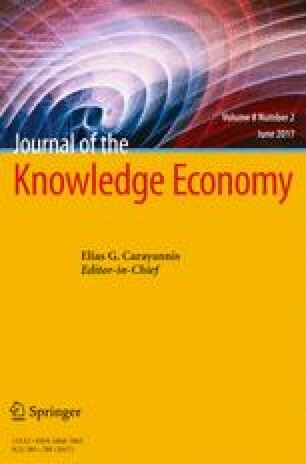 Keep open: the potential of gatekeepers for the aligning universities to the new knowledge triangle. Technological Forecasting and Social Change, in print, doi: 10.1016/j.techfore.2016.03.012. Powell, K. (2013). Higher education: on the lookout for true grit. Nature, 504, 471–473. http://dx.doi.org/10.1038/nj7480-471a. Shmatko N, Katchanov Y. (2014). Complexity-based modeling of scientific capital: an outline of mathematical theory. International Journal of Mathematics and Mathematical Sciences. ID 785058; doi: http://dx.doi.org/ 10.1155/2014/785058.